I will never forget chatting with my dad a few months before I married Jeff. I could talk to my dad about anything. We talked about choosing my maid of honor and bridesmaids. So many things my dad said to me during my growing years were full of wisdom. He said, "Marie, family will be your family for all of your life." There are five years between Brielle and Aubrey. As sisters, they have been there for each other through life's ups and downs. Brielle graduated from Oak Knoll School in 2007 and Aubrey followed in June of 2011. I had the pleasure of designing white graduation gowns for both Brielle and Aubrey. Brielle graduated in 2011 from the University of Richmond. Brielle majored in Psychology and double minored in Leadership and Medical Humanities while serving as President of Kappa Kappa Gamma. We always enjoyed our visits to the beautiful University of Richmond campus and of course being a guest of Brielle Hunt. We will enjoy visiting Richmond even more now that she and Alex have bought a home in Richmond! This is one of my favorite pics of Brielle and Aubrey taken on graduation weekend in May of 2011. Brielle took Aubrey around the University of Richmond campus and showed her everything from her own point of view after spending four years on this beautiful campus. Aubrey would begin her studies at the University of Richmond in the fall of 2011 as a student athlete and play for the Richmond Spiders Field Hockey team. I believe there is no better gift than having my kids home. The reality is those days become increasingly rare as they grow older. I appreciate any time we are able to spend together. This pic was taken on a beautiful summer night at our home in NJ. Who would ever think these sisters would end up together again...? Brielle and Aubrey decided to live together for one year while Brielle studied at Richmond Law and Aubrey pursued her undergraduate degree in Motivational Psychology. They lived on Granite Ave in an adorable little house that could have been featured on HGTV. They refinished the furniture together...while I reupholstered their couches. I always wondered what they were thinking in this pic. Could it be..."What happens at Granite Ave...stays at Granite Ave?" The Hunt sisters survived a year of living together in Richmond...and now, in six months, Aubrey will lead the way just a few steps ahead of her sister, as Brielle walks down the aisle to say "I do." With Brielle's beautiful bridesmaids in mind, I kept an eye out for what was ahead in bridesmaid fashion when I attended the bridal market in New York City. Softly swept, muted hues were the incoming theme. Brielle couldn't go wrong with the simplistic romance of the 2017 bridesmaid style. Wtoo was a favorite of mine. Their soflty tailored bodice designs are gorgeous and flattering. Attending market is always like a marathon for me. Living in close proximity to New York City, I buzz in and buzz out tending to any market needs in one day, while most shop owners walk market for days. Jenny Yoo was found at the closing bell of bridal market. All I can say is everyone loves Jenny Yoo! It was time for the Hunt girls to do their own research. Aubrey went down to visit Brielle In Richmond and spend an afternoon shopping for the perfect bridesmaid dress. I love the idea of separates for bridesmaids. I could see this skirt with a wrap blouse or a lace crop top. I am considering separates for my own dress design for the wedding, but I will save that for another blog post. Brielle explored many colors for her fall wedding. She was smart to follow certain colors of other bridal parties on Instagram to see how they would actually photograph before making her decision. Today's designers offer beautiful color selections. This gown was stunning on Aubrey! 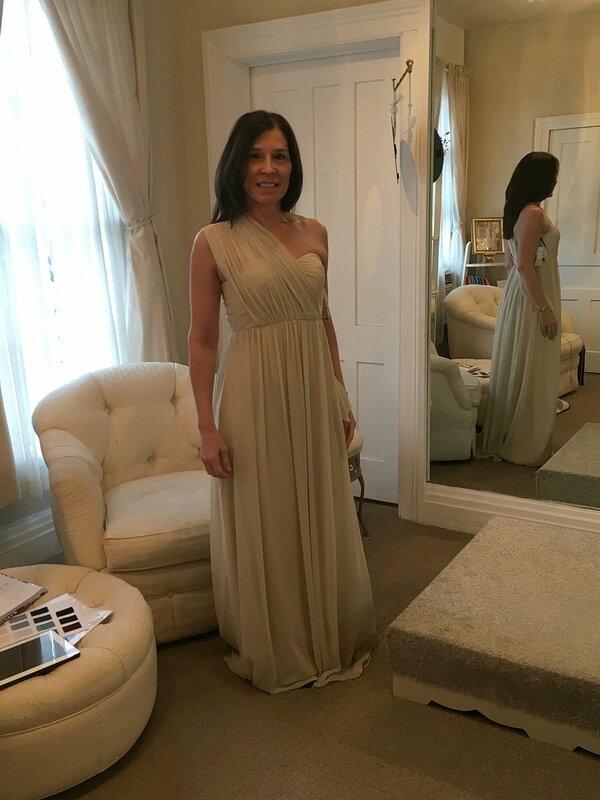 Brielle asked me to come along to see the bridesmaid gown selection at a beautiful boutique in Saratoga Springs, NY. The collections at Lily Saratoga were right in line with what Brielle was looking for. The boutique was quaint and decorated to make you feel as though you were in someone's home. 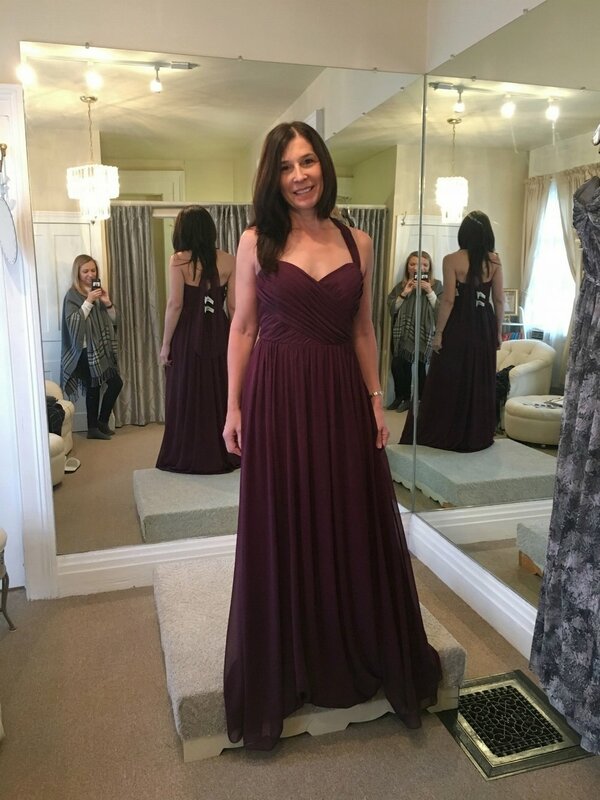 The staff was sweet and welcoming while recognizing our predicament of choosing bridesmaid gowns with a bridal party of eight girls living in five different states. They were very accommodating and happy to show Brielle their designer bridesmaid silhouettes. The only problem was there were no bridesmaids in attendance on our mother/daughter weekend in Saratoga Springs. We needed to improvise if she wanted to get a real feel for how they would look on her girls. A mother always does what a mother has to do! Brielle asked me to try them on. A baby makes your heart flutter. Their scent, their beauty, their presence is like that of a beautiful flower that has bloomed in an open field and opened your eyes to love. Little Abbey stole Brielle's heart right from the beginning. After researching the proper title for their relationship on Google, I found out that Abbey is Brielle's "first cousin once removed" and not her second cousin. "The appropriate name for addressing your cousin's child is niece or nephew, even though they are actually first cousins once removed." This is good information to know for the ceremony program, although all that matters is that we are family. After carefully considering her duties... and requesting a special piece of wedding cake, this little doll accepted Brielle's request to be her flowergirl. When we shopped for Brielle's wedding gown, "quality in design" was our number one priority. One designer came to mind when thinking of quality design for children. That designer is Isabel Garreton. I met Isabel and her daughter, Veronica, at the Children's Club Show in March. Isabel Garreton's garment construction and finishing details are top in the industry. You will find details that are rarely seen in today's garment production, such as, french seams, hand-smocking, hand-embroidery, and delicate lace insertion. They are the nicest people to work with and Headpiece.com is a proud retailer of their couture Christening gown and romper collection (shown above). Isabel Garreton might be the perfect starting point for Brielle's flower girl dress search. Flower girl photos by Isabel Garreton Inc.
"Mom...why don't we make the bridesmaid bouquets?" asked Brielle. "Uggh! ", replied Mom. Aubrey's beautiful rose bouquet at Gracie and Mile's wedding. Brielle and Emily were roommates for two years at the University of Richmond. Brielle was a bridesmaid in Emily's wedding and now Emily will be a bridesmaid in Brielle's. Emily's bridesmaid bouquets were simply beautiful! I always say I can design anything. I designed my bridal bouquet and bridesmaid bouquets in 1982, but the flowers were silk and couldn't die. I felt designing fresh flower bouquets was one thing I couldn't do...until I tried. 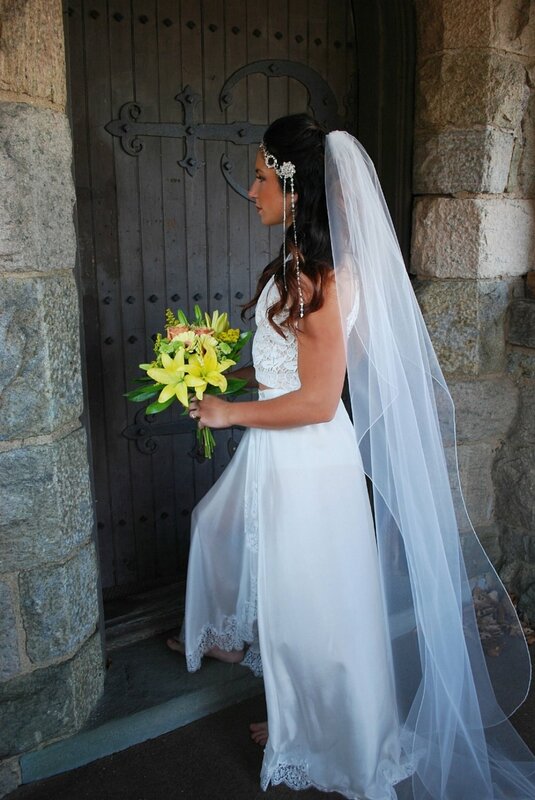 My first attempt at a fresh flower bouquet was for a styled photo shoot at Skyland's Manor in Ringwood, NJ. I assembled it in fifteen minutes just hours before the shoot. It survived the shoot and even more! It lasted in a vase for almost two weeks after the shoot. Maybe we could design the bouquets after all! PIctured is our April headpiece with Sadie brooch, Anna veil, and custom silk and chantilly lace bridal skirt modeled by The Bride Trainer. Worried my first bouquet was just luck, I tried it again with different flowers for a fall photo shoot. This bouquet was perfect for the time of year and also lasted for weeks after the photo shoot. I texted Brielle some pictures and said to her, "I think we can do it!" So we have decided to make the bridesmaid bouquets together when we all gather in Richmond for the wedding. Champagne will be flowing as we enjoy each other's company and the bridal party creates their own one-of-a-kind bouquet to carry down the aisle. Pictured is our Codie headpiece with Codie drape, soft European net Lizette veil, and custom silk and European net bridal skirt modeled by The Bride Trainer. Step one: Choose your flowers and your color scheme. Step two: Remove all greenery from the stems. 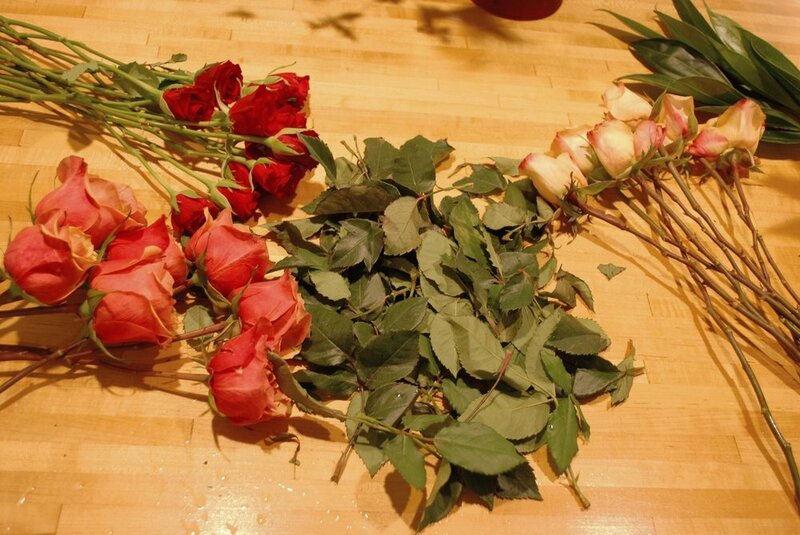 Step three: Arrange your flowers and tie them off with wire. Step four: Wrap the stems with floral tape and trim the ends. 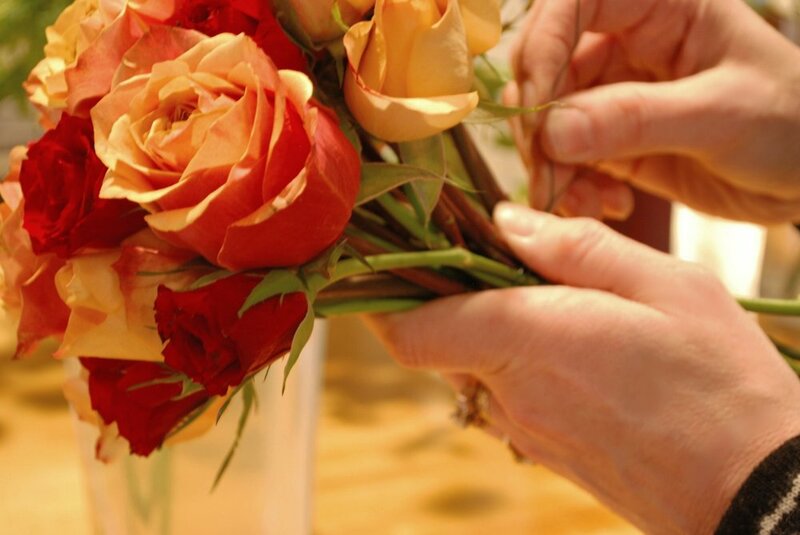 Step five: Give your bouquet a drink and prepare any extra decorative touches to complete your finished bouquet. 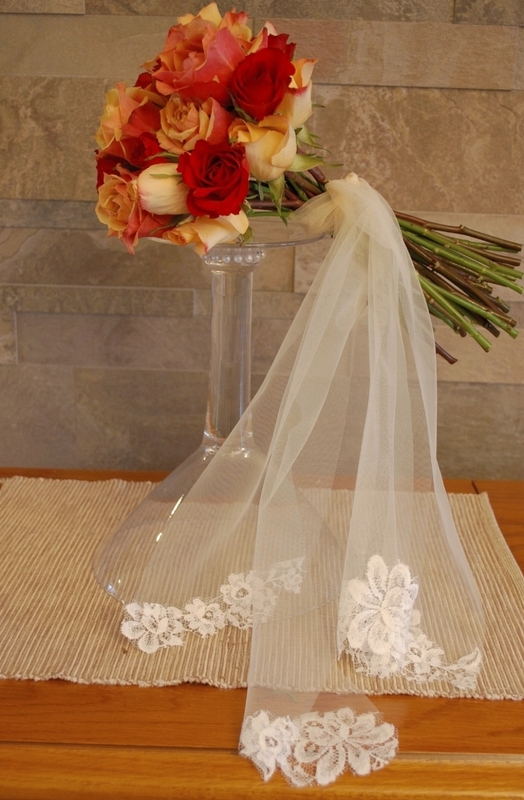 I decided to finish the bouquet with some European net trimmed in soft French lace to wrap around the stems. Six months to go. So many design concepts and ideas have been decided upon. Now it is time for production. It will take a careful balance to accomplish all with our growing client demands at headpiece.com. If only there were more hours in a day. I never run out of energy for design. I hope to find those few extra hours so I can begin design on my dress. Thank you for following our wedding journey.